Eight PLS Outputs, Motion Output, and Fault Output in compact chassis. No external power relay chassis or customer power supply needed. Selected models do not use relay rack except for expansion greater than 8 outputs. AVG Automation's PLS and Mini-PLS families have continually set the standard for speed, precision, reliability, and product features in the Programmable Limit Switch (PLS) market­place. While retaining the key features and high-standards of other AVG Automation products, the M1050 combines 10 power outputs, fault detection and indication, eight user­defined PLS programs, and simple, easy-to-learn programming, in one compact unit with a NEMA 12 front panel. In addition, each of the eight PLS programs supports up to 80 ON/OFF setpoint pairs for 8-channel units, or 160 for 16­channel units, which may be used in any combination per eight output channels. Included is a fault output which indicates on the display the source of the fault for fast, easy troubleshooting and a motion detector which energizes when the resolver is rotating between the HIGH and LOW user-programmed limits. In the normal operating mode, the large, 0.56" (14.2 mm) numerical display indicate the selected PLS program number, the selected channel number, and the current resolver RPM and position. When programming PLS setpoints, the display shows the program number, selected channel number, and the selected ON and OFF setpoints. 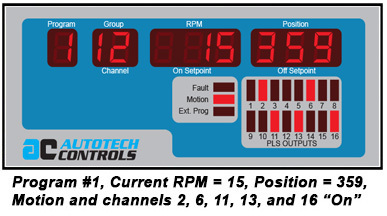 In all modes, bright easy-to-read bar graph displays the TRUE output status of all eight or 16 PLS outputs, as well as the fault relay status, the motion output status, and the external program select enable input status. 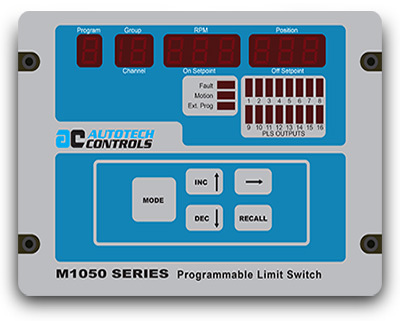 With these five self-explanatory programming keys, programming the M1050 is extremely simple. No long complex key sequences to remember. All programmed values, except Scale Factor and the PLS program number, can be adjusted with the machine running, making fine-tuning of job parameters easy. Two fully isolated supervisory inputs prevent accidental or unauthorized program changes. The M1050 PLS can operate up to 1800 RPM while maintaining a timing accuracy of less than 100 µs. Makes Job Changeover Easy The M1050 PLS can store up to eight independent, user-defined PLS programs for different machine setups. The M1050 is easily configured to accept either front panel or external PLC­compatible input to select a program. The M1050 PLS features a rate offset to compensate for speed variations. This rate offset represents a positive number that varies linearly with RPM. The rate offset is added to the resolver position and is used to advance the PLS settings as a function of the machine speed. In M1050, the rate offset can be programmed in Scale Factor units per 10 or 100 rpm, depending on model, up to full Scale Factor value. The built-in tachometer and motion detector are accurate to 1 rpm and are updated over 68 times per second to provide fast, accurate indication and detection of rotary motion. The motion detector is programmed to energize a power relay output when the machine's RPM falls between the low or under-speed limit and the high or over-speed limit. The motion detector output status is always indicated on the front panel. The fault output is normally energized when the M1050 PLS is operating properly and the resolver wiring is intact. If an internal M1050 fault is detected, or the power fails, or one or more of the resolver wires is broken or disconnected, the fault output will de-energize. Under fault conditions all PLS outputs and the motion output will de-energize. The M1050 Brake Monitor measures the time it takes to bring a rotating machine shaft to a full stop. If the shaft fails to stop within specified safety limits, Caution or Danger outputs are turned OFF. If the shaft stops safely in time, the Safe output turns ON. The M1050 combines the ruggedness of a brushless resolver and reliability of an advanced solid-state control. The rugged, heavy-duty NEMA 13 (IP54) resolver can be mounted on a machine shaft in any hostile environment, such as mechanical shock, vibration, extreme humidity and temperature changes, oil mists, coolants, solvents, etc. And the programmable control unit, M1050, can be mounted up to 2500 ft. away in a control panel. The splash proof, oil-tight front plate permits the unit to be installed directly on the machine itself, if required. The ratiometric converter assures high-tracking speed of 1800 RPM and high-noise-immunity. All M1050 inputs and outputs are fully isolated from user power sources to provide outstanding electrical noise immunity in harsh industrial environments.